Endurance.Net: USA News: Julie Chaney Completes the 485 mile Colorado Trail! Julie Chaney Completes the 485 mile Colorado Trail! The Colorado Trail is divided into 28 segments, stretching from Waterton Canyon to north of Durango. Each segment is between 11 and 33 miles for a total of about 485 miles. 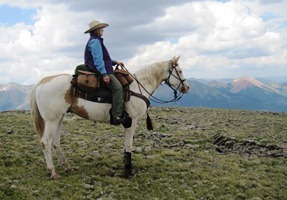 Ms. Julie Chaney, Colorado Horse Council Board Member and member of the Front Range Back Country Horsemen (FRBCH), has been working to complete the Colorado Trail for seven years. Each year, the FRBCH spends a week riding another section of the trail. Ms. Chaney has ridden through some sections multiple times. They have been working to complete the Durango side of the trail over the last two years; riding 20-22 miles each day of their trip. The most difficult part of the trail is the last eight sections, from Creed to Durango, and is for advanced riders. 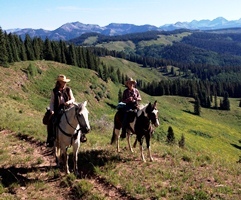 Ms. Chaney's favorite part of this seven year adventure is "the elation of being able to complete this challenge - being able to complete such a long and difficult trail on a horse that also has a mind of its own. Your responsible for not just yourself but for that horse as well." A very dedicated ground crew made up of spouses and friends supports the FRBCH during their week-long rides. The ground crew drives ahead to each of the camp sites, making available clean clothes, hot meals, certified weed free hay and other essentials. This is a challenge for the ground crew as well. Many days they drive 180 miles to get to the next camp site, dealing with flat tires and vehicle changes because of the tough terrain. Ms. Chaney says, "This is not for the faint of heart." Six members of the FRBCH have completed the Colorado Trail and one member, twice. For others that might want to take on this challenge, Ms. Chaney advises "research, research, research and buy the Colorado Trail book." Each year before their trip, members scout out the trails and campsites; the trails often change because of downfall. Forest Service." The FRBCH volunteer many hours for the BLM, Forest Service and State Parks helping to maintain trails, clear away downfall and educating others about good land stewardship practices. The FRBCH has 13,000 members nationwide and ten Colorado chapters. Learn how you can become an advocate for trail riding and support Back Country Horsemen, for more information about the Colorado Trail visit coloradotrail.org. For more information about the FRBCH visit frontrangebackcountryhorsemen.org and find them on Facebook.